Sometimes I think a dish or a recipe is so simple that no one else could possibly need to have it in their life. Such was the case with this combi steam fish dinner. It’s something I’ve been throwing together for years in one form or another, sometimes with fish, others with chicken, and I didn’t even really think of it as a recipe. More a quick fix for getting a meal on the table. But the more I’ve shared on steam oven cooking here, the more I see that the simple dishes are the ones you all keep coming back to visit, and the ones you talk about cooking. And the past few times I’ve made this, I’ve wondered why I haven’t shared how I do it. Easy dishes which make us feel nourished (and yes, accomplished), are the saviours of dinner. They’re the dishes I come back to over and over and the ones I know you all do too. I tend to cook fish one of two ways in my steam oven: gentle steam at a low temperature, or very hot and very fast using combi steam. Steaming is a good option when you want a soft, poached texture, and it’s especially great for whole fish. Combi steam, however, gives you that ‘best of both worlds’ thing. Make the most of the humidity in your oven to cook fish without drying it out, and get a golden, crispy crust on top to add texture. That’s what we’re going to do in today’s recipe, using Japanese style panko breadcrumbs, flaked almonds and lemon zest for interest. Feel free to play around with the ingredients I’ve listed. No flaked almonds? Try chopped pistachios or skip the nuts altogether. Lemon can be replaced with parmesan or finely chopped herbs, or you could mix through some sumac, cumin and coriander for a middle eastern flavoured fish instead. Potatoes are great, and a good twice-cooked hot chip or French fry, made in a deep fryer, is a true thing of beauty. But given this is not a website about deep fryers, and adding one to my kitchen line-up would probably also add several unwanted inches to my waistline, I prefer to leave my fried potato eating for when I dine out. Instead, you’ll more often find a sweet potato chip in my oven than a regular potato one, and after you try these I think you’ll see why. A couple of peeled and chopped sweet potatoes with a small drizzle of oil, salt, herbs and garlic tossed onto the tray makes for a side dish every single person in my house will happily eat a pile of. That’s no small feat, so now the biggest problem I’ve got is being able to fit enough of them into my oven at once. Don’t be afraid to get some good colour on your sweet potato chips. Because you’re using combi steam, the insides will be soft and tender, but that almost-burnt dark brown colour you’re going for adds so much flavour, and it’ll help get a bit of a skin on the outside rather than the sweet potato just being steamy and a bit floppy. I also add a sprinkle of semolina flour to help with the skin/crust, but this is optional and if you don’t already have some in the pantry, I wouldn’t buy a bag just for this. Happy steam oven cooking, see you here again soon (the third part in the ‘what foods to cook in your steam oven’ series is well on its way, for those of you who’ve asked!). This crispy almond and breadcrumb topping hides perfectly flaky, juicy fish fillets beneath. Cooking both the chips and the fish very hot and fast using combination steam means they’ll cook through and get golden without drying out. You can prepare all the main elements of this ahead of time if you like. Chop the sweet potatoes up to a day beforehand and store in a container in the fridge. The crumb topping can be mixed up minus the lemon zest and oil, then kept in an airtight container in the pantry for up to a few weeks. I do this, making double or triple the quantity so I’ll have some ready for busy nights. Just take out the amount you need, grate in the lemon and stir it through with the oil when you’re ready to cook. I serve this dish with a decent bought whole-egg mayonnaise, mixed with lemon juice and Dijon mustard to taste. 1. Preheat oven to 230°C/450°F, combination steam setting. If your oven has variable steam settings, select 60-80% (if not, don’t worry about this step, your oven will take care of this for you). 2. Spread the sweet potato chips over one or two baking trays in a single layer (I use my favourite solid stainless steel ones). If your steam oven is a full-size model you may be able to get away with only one tray, just make sure the chips are not really touching one another so they cook properly. Better to use two if you aren’t sure. Drizzle the oil over the chips and sprinkle the semolina (if using) and salt over the top. Toss to combine, then tuck the garlic and thyme sprigs amongst the sweet potato. Place in the preheated oven for 15 minutes. 3. While the chips start cooking, place the fish fillets into another baking tray. 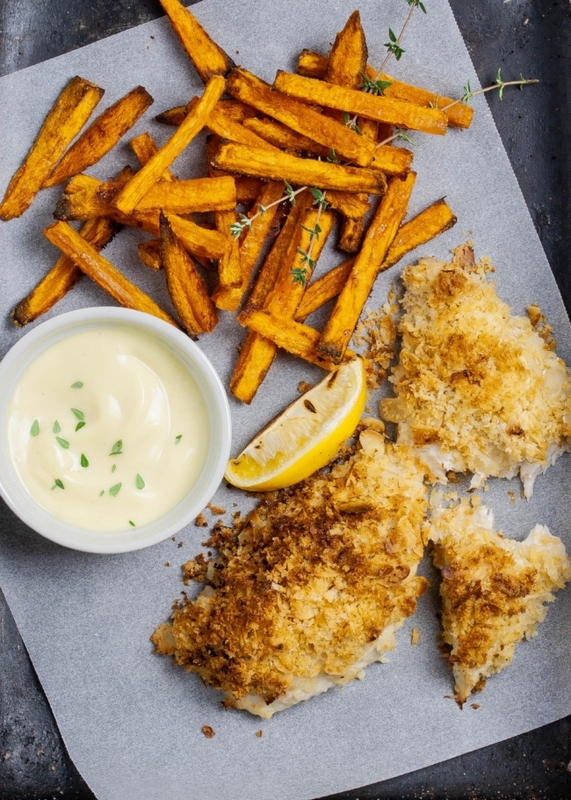 Mix the rest of the ingredients together except the whole lemon and mayonnaise, and heap the crumb mix onto the top of each fillet, gently pressing it down. 4. When the first 15 minutes is up for the chips, add the fish and set your timer for a further seven to eight minutes, depending on the thickness of your fish. If you’ve used two trays for the chips, swap them over in the oven as the fish goes in, so they cook evenly. 5. When the fish is cooked, remove everything from the oven, discard herbs and garlic (or save that soft roasted garlic for another dish) and serve immediately on warmed plates with lemon mayonnaise on the side. Would you like more Steam and Bake recipes and steam oven inspiration? Join the mailing list to receive an email every now and then to tell you the latest. When you sign up, you’ll get an invite to the exclusive subscribers-only Combi Steam Cooking Facebook group, which is full of people at all stages of their combi steam journeys, and with many different brands of oven. It’s a friendly, helpful space to learn and share with one another, and I’m always in there answering questions and sharing tips. And if you’re after more delicious combi steam dinner recipes, the index page has plenty. There’s a great sheet-pan salmon, potato and asparagus if you want another fish dish, a warming cauliflower and pumpkin soup if you’re battling the arrival of winter in the Southern hemisphere, or these maple, lime and ginger chicken tenderloins which are a bright and simple dinner no matter which part of the world you’re in!